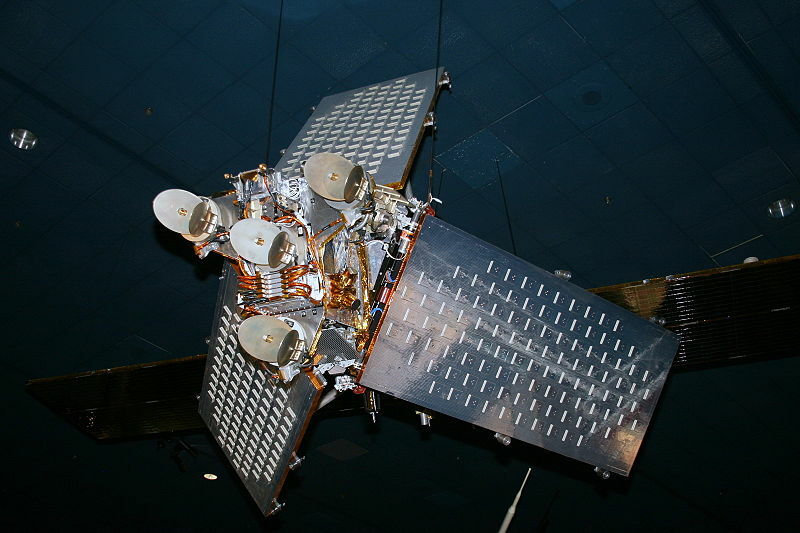 Iridium Satellite, Motorola, by Kozuch. Wikimedia Creative Commons. Last week I introduced the phenomenon of Iridium Flares – high intensity, focused reflections off Iridium satellites that affect a very small target area. I had done some research on frequency, likelihood of finding them, and determined this would be something everybody could reasonably do and provide an excuse to get out on a clear night and look up! This week I have to admit I’ve become a little obsessed with chasing these things down. I’ve been impressed at how predictable they are (provided you use precise location information for your viewing spot), and at how brief they are (only a few seconds). Still, after seeing a few that were so-so in terms of brightness, I didn’t really get the “flare” name. Monday and Tuesday, I was able to catch them, despite having not really done this before. – Monday I was watching a satellite track the sky, thinking that was my target – it wasn’t, but the flash a few degrees away was pretty apparent. OK, pretty cool. – Tuesday was iffy, the northern half of the sky was clouded. But just as I was getting worried, I saw it, just at the edge of the cloud. Cool – I can do this. But both these were magnitude -1 to -2. Wednesday was a complete bust. I was so excited, even called other people to let them know they were directly in the path for the center of the flare, I was looking forward to a -5 magnitude burst. The sky was crystal clear – and NOTHING HAPPENED. In fact, got no naked eye track on the satellite before the flash either. Didn’t make sense, as it should have been obvious. So after some web searching, I found that the satellite in question – Iridium 39 – had FAILED, and been moved out of the constellation, apparently back in June. So why was it predicted? I don’t know for sure, but I suspect that the calculator I’m using (heavens-above.com) is based on where the satellite is SUPPOSED to be, and assuming it’s in the correct orientation. The AR Satellite tracker on my phone also thought it was there. SO, a cautionary tale – this is why the new satellites are going up, and time really is running out on catching these. Not to be deterred, I tried again pre-dawn on Thursday. I say pre-dawn, and technically it was, but it was essentially daylight – this was maybe 20 minutes before sunrise. Blue clear sky, no stars in sight. The only things visible were the moon and Jupiter. I looked in the right spot, used my phone tracker to verify the satellite, and waited. Then – WOW! A really quick burst (second and a half?) at magnitude -6.7. Really bright in the middle of a clear blue sky. That was a FLARE! So now, I get it, and I’m psyched – and I really want to catch one of these things at Mag -7 or brighter, in a dark sky. If I stay home – the next chances will be Sunday night (-5.9) and again early Monday morning (-7.1). But I’m also realizing how NARROW the beam is – the center of these flares is often brighter than -8, and I can get to the center by driving 5 miles – that’s 5 miles to increase brightness by 100 times or more! So I just might do that. Going to start looking for parks under the path. It’ll be practice – in miniature – for nailing the total solar eclipse coming up this summer! Has anybody else been seeing these?